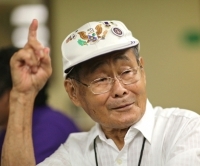 Interviewed in 2011 at age 96, Kazuma Monty Nishiie, an original member of the 100th Battalion, is still trim and alert, his small frame barely a wisp over 5 feet tall, posture as straight as when he was a soldier, alert eyes taking in everything going on around him. He speaks seriously and thoughtfully, occasionally inserting wry humor into his responses with little change in facial expression, only a slight hint of a mischievous grin giving away his intent. His secret to health and longevity? He points skyward and says, “The man above,” then pausing for effect adds, “and young wife.” Celia, his “young wife” sitting next to him, laughs heartily. 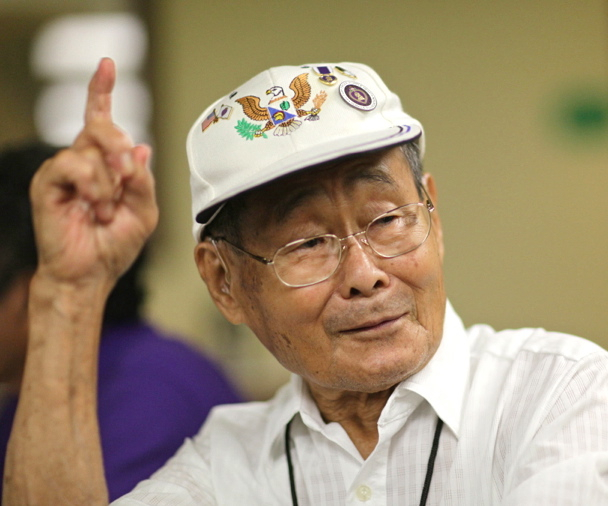 Nishiie pauses before responding to questions, seeming to review images in his mind to recall events that took place almost seven decades ago. He speaks in short, compact sentences, often using the bare minimum of words required to get his point across. My father was born in Japan. He came to Kauai as contract labor for Kilauea Sugar Plantation. Transportation in those days was very bad, many months on the ocean. Took long time. Terrible conditions. My father worked hard, long hours. My mother was picture bride. She came from Japan, met my father when she got off the ship. She was a teenager. I am oldest of 10 children, five girls, five boys. My mother, with 10 children, lot of work. Large family. Very hard living. Nishiie was drafted into the U.S. Army in 1940. 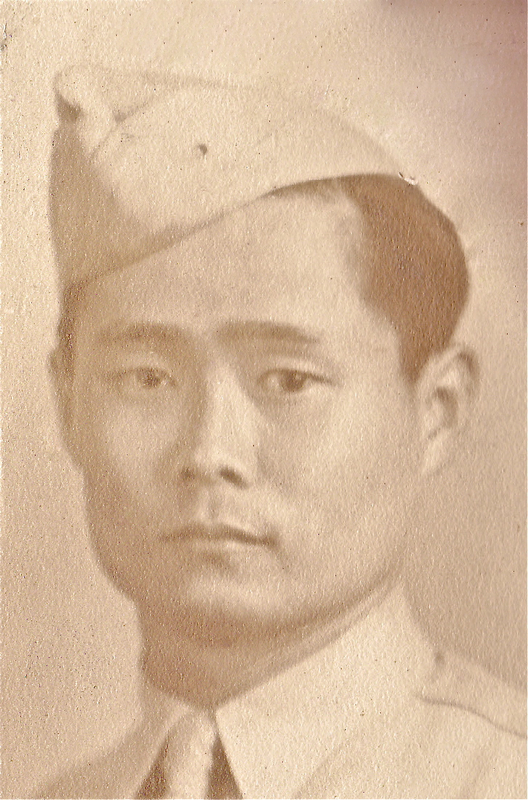 Soon after, he became a member of the original 100th Battalion, a unit comprised almost entirely of Nisei, the first generation of children born in America to Japanese parents. One of Nishiie’s younger brothers also joined the military. When Pearl Harbor was bombed by Japan, emotions ran high throughout Hawaii. We had to prove our loyalty. After the 100th Infantry Battalion completed basic training, they shipped out to Italy, an arduous journey. We were part of a large convoy, oh many, many ships. Had to zig zag to keep away from the German submarines. Conditions on ship were terrible. So many people, crowded, couldn’t get up. When they threw up, made you throw up, too. Very long trip. When the 442nd Regimental Combat Team arrived in Italy, we joined them to take the place of their First Battalion that had remained in the United States. The War Department was good enough to let us keep the 100th Battalion designation, so to this day it’s always 100th/442nd. Nishiie was wounded in 1943 near Monte Cassino, Italy, where a monastery also called Monte Cassino, sat atop a hill. He was awarded a Purple Heart, given to U.S. military personnel who are wounded while in war. I was on the mortar platoon. I helped fire an 81 mm mortar. You stand around the gun. One person drops the shell into the barrel and the shell hits the firing pin and the shell flies out. The mortar is not a direct firing weapon. It goes up and over, so the gun crew cannot see the enemy or the explosions. When we went on the hill, we could see Monte Cassino but the Germans could see us too. (He pauses, focusing on disturbing images from more than 60 years ago.) The Germans had already zeroed in on the place where the troops would pass. So right away, they threw a barrage and we had heavy casualties. It was terrible. I was injured on my right arm and both legs and feet. They brought me to the hospital. When I became well, the management didn’t send me out or discharge me. They kept me in the hospital to take care of the laundry department. Everything has its day. Everybody was happy I came home. My father was still alive and working as a rice farmer at Kilauea Stream. Many veterans returned with what they call shell shock. I spent my time outside fishing and hunting. Let the mind forget the war. I think it helped me. In 1953 I got married first time to Keiko. My parents and her parents came from the same place in Japan. 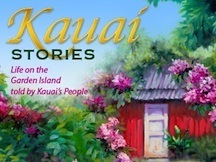 She was born in Waimea, Kauai, brought up by her auntie and uncle in Japan because they had no children. We got married in Waimea, simple, simple, simple wedding. Secret to long marriage? Don’t argue too much. Celia: When I came over here, we got married, May 28, 2003. In one of his letters he said he is a “veteran” but I don’t know what kind because he did not tell his age before. He said, “I am” then blank then a question mark. Nishiie: I have a problem: very talkative wife (laughs). 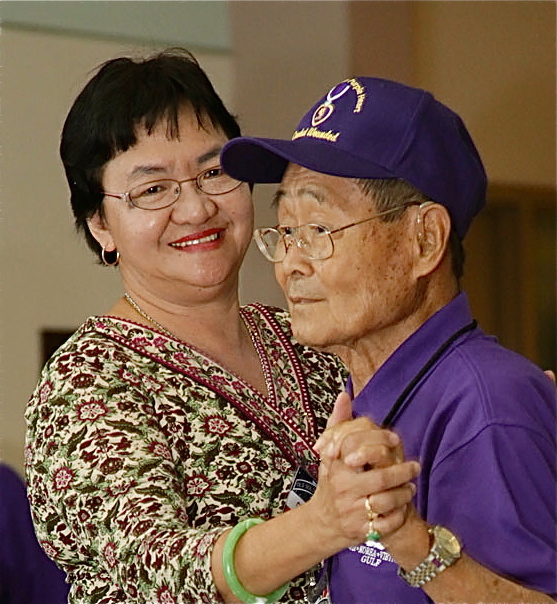 Upon learning of his military service, Celia has ensured that her husband has taken part in veterans events, where he is warmly welcomed and clearly well-respected by all other veterans in attendance, men often reverently pointing him out to others. In 2011 he took part in the 79th National Conventional of the Military Order of the Purple Heart in Minnesota where he was recognized by General Eric Shinseki (Ret. ), the U.S. Secretary of Veterans Affairs who was born and raised on Kauai; the 22nd gathering of the Old Soldiers of Hawaii Reunion; and the Congressional Medal of Honor Ceremony in Washington, D.C.